Oval engagement rings have long been a favorite of brides to be. This is probably because of the uniqueness and beauty that only an oval diamond brings. Although and oval diamond engagement ring tends to be not as common as a round brilliant engagement ring, they are very beautiful and have some unique characteristics. An oval diamond usually has 56 facets and provide a stunning look when set in a ring. When selecting an oval diamond, you should be careful and select an oval diamond that has a good clarity rating. This is because of the ability to see more of the diamond because of the oval shape. This also means that an oval diamond will make the diamond look larger just because of the shape. Oval diamonds are known to be a slimming diamond because they make the finger appear to be longer and slender. Just like clothes with vertical stripes have a slimming characteristic, the oval shape of the diamond along the finger tends to make the finger look slimmer. As we mentioned earlier, because of the oval diamond shape, the oval diamond will also look larger than a round shaped diamond. 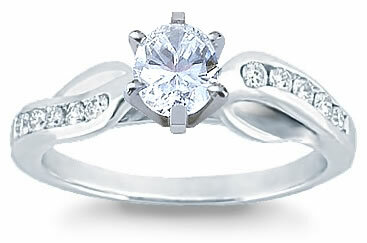 Oval engagement rings are somewhat cheaper than a round diamond. This may be due to the greater demand for round brilliant diamonds especially within certain sizes like a 1 carat diamond. You may be able to save some money by purchasing an oval diamond. The easiest way to find an oval diamond is to use the fast and easy diamond search tool found right here at our site, Novori.com. Ultimately, an oval engagement ring is a ring that she must love because it will be a symbol of your love that she will wear for the rest of her life. Make sure your loved one loves the look of an oval diamond before you surprise her with it. It has a unique look that only an oval engagement ring can bring and she should give her seal of approval to the look. Oval engagement rings are a beautiful way to create a unique ring and because of the price of an oval diamond, it may even save you some money. Oval diamond engagement rings aren’t as popular as traditional round, princess, or marquise diamond engagement rings but they are not any less beautiful to wear. If you ever need help with finding an oval diamond, we are here to help you. You can call Novori Jewelry toll free at 1-877-877-4141 and we would be glad to assist you.